How Much Can You Make in a Information Technology Career? What Courses Can be Taken for an Online Information Technology Degree? Information technology professionals maintain an organization’s software and hardware systems. They make sure a firm’s technology works properly and is updated with the latest advancements. These professionals also work with managers to determine the technological needs and goals of an organization. The information technology field is growing rapidly due to an increasing reliance on cloud computing and big data storage, and a growing concern for information security across industries. The Bureau of Labor Statistics (BLS) projects a 13% growth rate in computer and information technology occupations from 2016-2026. Most computer and information technology professionals hold at least a four-year degree, and many choose to earn their bachelor’s degree in information technology online. Online programs feature the same curricula as an on-campus program, but have more flexibility. This guide covers the careers, salaries, courses, and costs that online information technology students can expect. Below you will find a list of the best online bachelor’s programs in information technology. Government data for each school was provided by the National Center for Education Statistics. Programs are ranked based on data points, including graduation rate, number of online courses, and tuition cost. The school profiles below introduce the common courses, requirements, and characteristics that are best for students looking to earn an information technology bachelor’s degree online. Liberty University is a private nonprofit institution, established in 1971, and is one of the largest Christian schools in the country. In its Bachelor of Science in Information Technology program, distance learners develop the professional design, organizational and technological skills that are valuable at every modern company. With this 120-credit hour bachelor's program, you will also meet the growing demand for applications and database developers who are the main technological problem-solvers for businesses and organizations. In this program, you will choose an area of specialization in application and database development, data networking and security, game design and web and mobile programming. Liberty's unique gaming design concentration will help you explore cutting-edge technology in the field with courses such as Interactive Game Development, C# Programming, digital imaging and Introduction to 3D graphics. Students who are interested in the burgeoning mobile applications industry may take an interest in Liberty's mobile programming concentration, which includes courses in Client-Side Programming, Server-Side Programming and Web and Mobile Applications. This Christian school also requires online learners seeking bachelor's degrees to take 12 credit hours, or 4 classes, of "Christian Life and Thought" courses. Full-time students can expect to spend about 3.5 years completing this degree. Applicants must submit unofficial transcripts, a high school self-certification form and have a minimum cumulative GPA of 2.0 for full admission. Probationary admission may be granted for those promising applicants with a lower GPA. Incoming students may transfer credits toward this degree, including those with prior learning experience, AP credit, or military experience. Emergency responders and active military receive a significant tuition discount. The University of Illinois is a public institution established in 1969. As one of its 27 undergraduate degree programs, you can earn a Bachelor of Science in Management Information Systems degree entirely online. Students in this program receive a type of training that combines both the technical and managerial skills needed for success in today's complex business world. Through information systems core courses like Data and Information Management, Electronic business Strategy, Systems Analysis and Design and Enterprise Architecture, you will acquire knowledge of organizational functions and processes while exploring organizational behavior constructs related to information systems and technology. Incoming students for the online bachelor's degree at UIS must be classified as an undergraduate transfer student, with at least 30 previously earned semester hours from a regionally accredited institution. For graduation, you will need a total of 120 semester hours. This typically takes full-time students approximately 4 years to complete, depending on course availability and your course load per semester. You must also earn a minimum grade of C- or better to remain in good standing with your department. Online students have access to both the Career Development Center and Counseling Center. Both offices provide academic counseling, career planning and one-on-one advising that will help you get the most out of your online degree. Distance learners will also be able to prepare for their new careers as they enter the competitive job market. All applicants to UIS must submit their standardized test scores, GPA and high school class rank. Admitted students in recent history have had a 2.0 GPA or higher. The University of South Florida has over 80 undergraduate majors and is the 4th largest public university in the state. 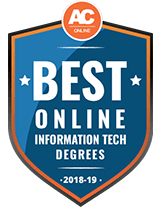 For those distance learners interested in working in computer programming, databases, online networks, human-computer interaction, web systems and cybersecurity, USF's online Bachelor of Information Technology could be an excellent choice for you. In this program, you will learn to meet the technology requirements of businesses, government agencies, healthcare providers, educational facilities and nonprofit organizations. Through a combination of fundamental knowledge and practical expertise, you will learn over the course of 120 credit hours how to solve computer technology issues and meet user needs. As part of FSU's Department of Computer Science and Engineering, online students are trained to lead the advancement of information technology, cybersecurity and other computer technology-based sciences. You will also learn the best ethical practices in the field that will serve a diverse society and encourage lifelong learning. For admission to the information technology major, all students must pass four courses, Discrete Mathematics, Databases, Programming Fundamentals and Object Oriented Programming, with a minimum grade of a C in each. Information technology students must also maintain an overall minimum 2.0 GPA throughout the program. Transfer students must complete a minimum of 18 credits at USF to be eligible for graduation. During their first year, most students arrange for an internship through USF's Career Services Cooperative Education (Co-Op) for their 2nd, 3rd or 4th year in the program. Online undergraduate students also have opportunities to participate in cutting-edge research programs directly. In most cases, you will be able to receive credit toward your degree for any mentored research experience approved by the department. Bellevue University offers a 127-credit online Bachelor of Information Technology degree that focuses on the fundamentals you will need to succeed in the industry. The curriculum explores foundational topics such as online networks and network security, routing and configuration, servers and data storage and cloud computing. Bellevue graduates earn the best IT practices for installing and upgrading computers and operating systems. You will also have the ability to set up the most secure computer, cloud, and server environments to ensure that business and organizations have the safest possible network. Online learners who complete this program are prepared to sit for IT certification exams while boosting their employability and earning potential. As a distance learner, you will complete a rigorous 36-credit hour curriculum of required IT courses. From Hardware and Software Management and Microsoft Operating System Management to Cisco Routing Fundamentals and Network Infrastructure, you will experience a far-reaching host of modern classes. Students also choose several elective courses, such as Linux training and Ethics for IT Professionals, which help you tailor your education to fit your interests and career needs. Incoming students may be able to transfer up to 60 credits toward their Bellevue degree. You don't have to submit an ACT or SAT score for admission, but a high score may qualify you for an internal scholarship or financial assistance. Incoming students must complete an ALEKS mathematics placement assessment and can take additional optional placement exams through the testing center. Bellevue subscribes to an open enrollment policy and online students may begin their asynchronous coursework at several starting points throughout the calendar year. As a distance learner, you have access to 24/7 technical support, full-text library materials, academic advising and career services. Murray State University is a 4-year public institution serving over 10,400 students. The school offers 66 bachelor's degree programs with 97 specialized track options. Distance learners can earn a Bachelor of Science in Business with an area in Computer Information Systems. As a business degree, you will receive comprehensive training in core business courses including Business Ethics, Statistics, Principles of Finance and Strategic Management. With a concentration in Computer Information Systems, you will also receive 13 credit hours of classes such as E-Business Programming, Topics in Information Systems and System Analysis and Design. Additionally, distance learners may choose from a wide variety of concentration-specific electives to further hone their skill set. During your senior year you will complete a capstone project that encapsulates and displays your mastery of the major material. Admission to this program is a two-step process. First, you must be admitted to Murray State by submitting the standard undergraduate online application. When you are accepted, you will be assigned an advisor in the Center for Undergraduate Business Advising in the Bauernfeind College of Business. After successful completion of the preadmission course requirements with a minimum overall GPA of 2.0, you will be admitted to the program the following semester. Applicants must submit official ACT or SAT scores. Alternatively, Murray State also accepts Accuplacer or KYOTE scores. Competitive applicants have a minimum 3.0 GPA and an 18 or 870 on the ACT and SAT, respectively. Students in the business school have access to their own specialized academic advisers in addition to career services and counseling. In total, this degree requires 120 credits for graduation and typically takes full-time students 4 years to complete. Established in 1872, the University of Toledo is a 4-year public research institution serving over 23,000 students. Located in the College of Business and Innovation, UT offers a Bachelor of Business Administration in Applied Organizational Technology. Distance learners in this program learn to increase business performance by improving process efficiencies, integrating technical solutions and taking advantage of new technological opportunities in the global economy. Most students configure their coursework using electives to fit their academic and career needs. Graduates with this degree seek out positions as management analysts and IT project managers. In this department that advantageously combines instruction in science, management and engineering, UT graduates also obtain supervisory roles at companies that specialize in construction management, utility technology, computer information systems and automotive technology. This is a degree completion program where incoming students typically already have an associate degree. Applicants must also have a minimum cumulative GPA of 2.25 to be admitted to the business school. Students who do not meet the business school's admission requirements upon their first attempt, but who are admitted as a UT undergraduate, will be placed in the University College's Department of Exploratory Studies. Upon satisfactory completion of the minimum requirements, students then may transfer to the business school and begin their coursework in Applied Organizational Technology. You will need 126 credit hours, with a minimum 2.0 GPA, to graduate. Online learners living outside of Ohio and Monroe County, Michigan, with a 2.75 GPA high school or transfer GPA are eligible for a 4-year renewable scholarship to assist with UT's out-of-state tuition surcharge. All applicants must submit ACT or SAT scores as well as official transcripts from their associate degree program and high school. Dakota State University offers a Bachelor of Science in Computer Information Systems degree that can be completed entirely online with no on-campus obligations. Distance learners choose from 1 of 3 concentrations: Business Analytics, Project Management or Software and Web Development. DSU students develop the ability to meet virtually any technological demand in the business world through training in programming, computer hardware and database management systems. With major courses such as Database Management Systems, Principles of Microeconomics and Information Systems Planning and Management, DSU graduates enter the job market prepared for positions as data analysts, web developers, IT consultants and database administrators. High achieving undergraduate students in this program may be eligible to enter DSU's Fast Track program during their senior year. This track provides students with the opportunity to earn both a bachelor's and master's degree in 5 years. Applicants must take the ACT or SAT exams and earn at least an 18 or 870, respectively. Additionally, incoming freshman must have taken high school coursework in English, advanced mathematics, laboratory science, social science and fine arts. All students must maintain a minimum cumulative GPA of 2.0 or higher throughout this 120-credit degree program to be eligible for graduation. At least 30 of the total 120 credits required for the degree must be completed at DSU, including the final 15 credits. Distance learners may be eligible to take more than a full course load per semester, thus finishing their degrees more quickly. In this case, however, you must have a 2.70 cumulative GPA and approval from the department. Davenport University is a private nonprofit institution that provides its students with hands-on learning methods and training that explores the challenges that professionals encounter in computer technology fields. As a distance learner, you can earn the Bachelor of Science in Computer Information Systems online at DU. You will acquire essential skills that allow you to create and test drive computer applications, software and websites. You will also train with high-level problem-solving scenarios dealing with online network systems and programming. Online learners in this field choose from 5 specialty areas: Cooperative Education, Programming, Web and Mobile Development, Database and Analytics and Secure Software Coding. For those students who want a deeper understanding of math's role in computer technology fields, and to acquire an additional credential to be more competitive in the job market, DU recommends its optional minor in mathematics. DU graduates often seek employment in a variety of positions including computer technicians, database administrators, web designers, software engineers and computer information specialists. In total, you need 120 credits to graduate. In addition to 28 credits of general education courses, DU online students take 10 credits of foundational business courses and 66 credits of Computer Informations Systems training. Your chosen specialized track is comprised of 15 credits total. Prospective students must submit official transcripts, ACT or SAT scores, qualifying COMPASS assessment results. Applicants should have a minimum high school GPA of 3.0, ACT or SAT scores of 23 or 1130, respectively, and 2 letters of recommendation. Depending on the specialty area, online learners pursuing the Computer Information Systems degree may be required to have an interview with a faculty member in the College of Technology. George Mason University offers a Bachelor of Science in Information Technology for distance learners. This degree can be completed entirely online at this public research university, with a few to zero on-campus obligations depending on your chosen electives and specialty coursework. Distance learners are equipped to make the most out of professional IT resources, apply information technology to support business efforts and become technology problem-solvers. The program is accredited by the Computer Accreditation Commission of ABET and requires 120 credits for graduation. As a GMU online learner, you will choose from 5 concentrations: Database Technology and Programming, Health Information Technology, Information Security, Network and Telecommunications or Web Development and Multimedia. In addition to 33 credits of core courses and the 15 credits dedicated to your specialty area, you must prepare for your required capstone project with the classes Senior Design Project 1 and 2. All online students will complete the major core courses which include IT in the Global Economy, Managing Financial Resources, Human-Computer Interaction and Data Communications and Networking Principles. This well-rounded degree program also requires undergraduates to complete 21 credits in the "Mason Core" curriculum, consisting of classes in quantitative reasoning, natural sciences, oral communication and information technology. Applications should include official transcripts from high school and any previously attended colleges, ACT or SAT scores, 2 letters of recommendation, a personal statement and a list of extracurricular activities and community service participation. Competitive applicants have a 3.0 GPA or higher. As an online student, you will have access to student support services including online access to the library, academic counseling and an online writing lab. The Bachelor of Science in Information Technology Management degree at National University prepares you for careers in consulting, marketing and sales, customer services and support and online security management. In total, NU online students must complete at least 180 quarter units for this degree. In most cases, full-time students can complete the degree in 4 years. The core requisites for the major consists of 16 courses, or 72 quarter units, and includes IT Servers Using Linux, Local and Wide Area Network Management and Wireless Security. Distance learners in this program must also complete a final capstone project for which there are 3 required preparatory courses. Applications for the program are reviewed throughout the calendar year. Admitted distance learners may start taking classes toward their degree during any month. Prospective students with no prior college-level classes in mathematics and English must take the ACCUPLACER evaluation. Incoming students may receive credit for prior learning experiences including military service or training, AP credit and college-level courses completed during high school. Competitive applicants have a 2.0 GPA or higher but those with lower GPAs may be admitted on probationary status. Online learners who have an interest in pursuing a career in cybersecurity may be eligible for NU's InfoSec Institute Cybersecurity Scholarship Program. Up to 4 students per year can receive this $12,600 award, 3 of which are reserved for African American, Hispanic or Native American students, women and military personnel. Recipients are also given free enrollment in a series of 3 progressive cybersecurity training schools to supplement their studies at NU. Scholarships require a separate application due on August 31. Georgia Southwestern State University is a public university, founded in 1906, with over 13,400 students. GSW offers online learners a 120-credit online Bachelor of Science in Information Technology degree. With 60 credits of major and elective courses, including Technical Communication, System Analysis and Design, Architecture and Operating Systems and IT Policy and Law, you will work through a thorough curriculum entirely online. As part of the WebBSIT consortium, GSW prepares new graduates to enter the field as network administrators, database administrators, webmasters and multimedia designers. Students are also required to complete 60 credit hours of general education classes. You must maintain a C average or better in mathematics, English composition and all information technology courses to remain in good standing and be eligible for graduation. To be admitted to the program you must first gain admission to UWG by submitting your official transcripts and completing the general online undergraduate application. All prospective students must submit their results from the SAT or ACT and take part in the Georgia WebSIT orientation. Each student with prior college credit will receive a credit evaluation. Incoming students may be able to transfer up to 90 credits toward their GSW degree. As a distance learner, you have access to several online academic resources including tutorial services, supplemental instruction opportunities, writing coaching, online test prep and study guides and the Office of First Year Experience, which helps students transition into college life. Most full-time students need approximately 4 years to finish this program. Located in the Turner College of Business, online learners at Columbus State University can earn an online Bachelor of Science in Information Technology degree. In this curriculum, you will explore the field and develop your communication skills through a combination of hands-on projects, quantitative analysis and theoretical concepts. Graduates of this program can apply business fundamentals and be critical problem-solvers and creative thinkers in business and information technology environments. You will also be able to design and create different kinds of computer software that help businesses make the most of their time and resources. Distance learners must complete 123 credit hours for graduation, including core courses in history, English composition, humanities, fine arts and ethics. Classes dedicated to learning the essential skills in information technology comprise almost 70 credits. With a high number of electives available in this major, CSU online students can pick and choose which IT courses make the most sense for their interests and career goals. Required major core courses like Data Communications and Networks, Systems Analysis and Design and Information Technology Management are often supplemented with electives such as Customer Relationship Management, Information Technology Seminar and Information Technology Policy and Law. Applicants for the online IT program must submit SAT or ACT scores, official transcripts and the general online application. As a CSU distance learner, you will have access to advisors who will develop personalized academic plans to help you get the most out of your degree. With over 100 student organizations and activities groups, CSU distance learners can also find some opportunities to interact with their fellow students outside of the virtual classroom. The University of West Florida is a public institution serving approximately 13,000 students. Distance learners can pursue a Bachelor of Science in Information TechnologyBachelor of Science in Information Technology in a hybrid format. In this program, you will learn foundation programming principles, database concepts, user support strategies, security techniques and systems planning methods. Graduates are ready for entry-level positions in database administration, software development and systems analysis. The information technology curriculum casts a wide net and ensures that you are ready for virtually any challenge in today's IT workforce. Distance learners will take essential courses like Data Mining, IT Security, Cloud Computing Operations and Security, Linux System Administration and Basic Web Applications. All students must complete a hands-on internship as well as a capstone project, which both count toward your degree. If you secure a highly intensive internship, you may earn more than the usual 3 credit hours. Online learners also have the opportunity to take at least 16 elective credits of their choosing. You must meet with an advisor to choose these electives and receive approval from the Department of Information Technology to take electives outside the department. While enrolled in the program, you must maintain a "C-" or better in all required courses to remain in good standing. Incoming students must successfully complete several lower-division courses that are common prerequisites, such as English, math, and science, for dozens of majors at any Florida public institution. Prospective students should check with the department or an UWF academic advisor to ensure all requirements are satisfied before you apply. Applicants should have at least a 2.5 GPA and submit their SAT or ACT scores. Military and veterans receive a variety of VA benefits including active duty tuition assistance, an out-of-state tuition waiver, tutoring, counseling and disability accommodations. At Saint Leo University, distance learners can earn a Bachelor of Science in Computer Information Systems degree with no on-campus obligation. Students in this program learn how to be computer systems experts who strategize and problem solve for virtually any kind of business. With this degree, you will help companies meet their goals by providing secure networks, cutting-edge computer applications and high-level technical support. Graduates of this program acquire marketing skills like project management, application development, systems analysis and programming and find themselves working as network administrators, security analysts, web developers and IT auditors. In total, you will need 120 credits for graduation. In addition to general education requirements, online students take around 66 credit hours of business and IT-specific classes. From Programming in C/C++ and Web Design to Business Law and Principles of Accounting, you will receive a diverse business-heavy technology degree at Saint Leo. The school subscribes to a rolling admissions policy. You may enroll at any time and begin working toward your degree during any of the six available starting dates throughout the year. Prospective students must submit proof of high school graduation or GED score report and official academic transcripts. Students with military experience may be eligible for credit toward their degree, provided they submit official notarized documentation of service. Online learners at Saint Leo have access to advising and career services that are specialized for online students. You can also be an active member of Saint Leo's online clubs and student associations which include supportive associations built around the school's major offerings. Through the College of Business at East Carolina University, distance learners can earn a Bachelor of Science in Business Administration degree with a concentration in Management Information Systems. As a degree completion program, this program is designed for students who have the appropriate prerequisites to transfer into ECU. In most cases, incoming students already have an associate degree. Of the total 120 semester hours, 18 are dedicated to the MIS concentration. At ECU, you will take Software Design and Development, Telecommunications and Networked Systems, and Web Application Development for Business and other IT-driven classes to explore the essential skills needed in today's modern business landscape. Additionally, you will acquire diverse business knowledge with courses geared toward strategic management, finance, accounting, and information technology. To declare a concentration and to have access to these information systems courses, you must have a "C" or better, a 2.5 GPA on selected business cognate courses and have completed 45 semester hours. Incoming students may test out of the Introduction to Computer class by taking a bypass exam. This credit-by-exam procedure takes 2-3 hours to complete and requires a 73.5% or higher to count toward your degree. Prospective students must complete an online application and show proof of having taken high school classes in English, mathematics, natural sciences, social studies and a foreign language. Applicants must also submit their ACT or SAT and official transcripts. While there is no minimum GPA for new freshman applicants, transfer students should have at least a 2.5 GPA. Those transfer students who do not already hold an associate degree can take advantage of ECU's reverse transfer program. Wilmington University offers a flexible degree program with courses starting every 8 weeks. Distance learners can pursue a Bachelor of Science in Information Systems Management entirely online. You will be prepared for leadership positions, with an understanding of foundational business processes, information technology applications and data warehousing. This curriculum closely aligns with several business degrees offered at Wilmington. As such, you will acquire the necessary business skills to be an in-demand employee and valuable leader in today's modern workforce. With hands-on assignments and training in classes such as System Analysis and Design, Data Modeling and Warehousing and Strategic Application of Information Technology, online students use current tools and technologies to develop practical expertise in this quickly growing field. Prospective students must submit their official high school transcripts and complete a math and English skills assessment. Applicants with an SAT score in both math and English of 450 or higher (or, for the new SAT, 530 and 480, respectively) are exempt from the skills assessment. Incoming students may transfer up to 90 hours toward their bachelor's degree, but at least 30 credits of the total 120 must be completed at Wilmington. Only those classes in which transfer students earned a C or better are eligible for transfer. Incoming transfer students with a GPA less than 2.0 must undergo an interview with an academic advisor to determine their course schedules. Distance learners have access to an online advisor to help them stay on track and get the most out of their time enrolled at Wilmington. You will also have access to technology services, including an online help desk and the Blackboard learning system. Career counselors are also available to help current students and alumni develop future career plans that make sense with their degree training and aspirations. Wilmington subscribes to a rolling, open admissions policy, and all interested students are encouraged to apply. Distance learners can earn a Bachelor of Science in Information Management Systems degree at the University of Maryland-University College. This program may be completed entirely online or in a hybrid format. As an Information Management Systems major, you will learn how to create and manage high-quality, secure information systems through a modern curriculum focused on the methods and practical applications of information systems in the workplace. Online learners at UMUC are also prepared for several certification exams including the Certified Associate in Project Management, Project Management Professional and PMI Agile Certified Practitioner exams. You will need 120 credits to graduate, which full-time student typically complete over the course of 4 years. Distance learners take 31 credits of general education courses and approximately 61 major-specific courses such as Information Systems in Organizations, Foundations of Information Systems Management, Enterprise Architecture and Business Continuity Planning. Online learners at UMUC usually participate in online discussions, work on group projects, and interact with their fellow classmates. You will, however, be able to complete courses at your own pace, with no scheduled times for you to be online, as long as you meet any scheduled due dates each week. Courses at UMUC are 8 weeks in duration, allowing you to focus on fewer courses at once while still making progress toward your degree. The school offers no-cost digital learning materials for most of its courses. Incoming students do not need to take the SAT or ACT and there is no minimum GPA required. At Baker College, you can earn a Bachelor of Science in Information Technology and Security and obtain administrative roles at numerous companies and organizations. In this program, you will earn a concentration in Server Administration and learn to manage the modern server-driven digital infrastructure. As you work through the required courses, you acquire essential skills for careers in the information technology field including network designing, data management and computer systems upgrading. You will also hone your sensory, communication, and critical-thinking skills. You must complete 78 credit hours of core courses such as Legal and Ethical Issues in IT, Designing for Security, Networking Essentials and Scripting for Network Administrators. The concentration in Server Administration entails 15 credit hours, consisting of Advanced Server Administration 1-4 and Information Systems Threat Assessment. Information Technology students learn to work with Microsoft products, Linux operating systems, Cisco products, database management systems, web servers and other related hardware or software that are standards throughout the industry. Many Baker graduates move to pursue careers as Server Administrators or enroll in a master's degree program. In total, you will need 120 credits to graduate. Most full-time students can complete this degree in 4 years. Applicants may submit ACT or SAT scores to help the admissions committee evaluate their qualifications but they are not required. There is also no minimum GPA requirement for admission. Transfer credits are accepted at Baker but must be discussed with an enrollment coordinator before you apply. Distance learners at can take advantage of the school's online learning system, including the Blackboard platform, and a variety of online student services. From library access and tutoring to online technical support, Baker does its best to support its learners no matter where they are. Distance learners enrolled at Western Kentucky University can prepare for exciting careers in the information technology field by earning an online Bachelor of Science in Computer Information Technology. As an integral part of modern business life, computer information technology professionals help businesses and organizations transfer, store, analyze and access important data. An online degree from WKU positions you for work as Computer Network Architects, Programmers, Support Specialists, Database Administrators, Software Developers and Information Security Analysts. This bachelor's degree requires 120 credit hours and no minor concentration is necessary. You must earn a C or better in all CIT courses to remain in good standing. You may also choose 27 credits of electives to further tailor your degree to fit your academic needs, provided the courses are picked from the department's CIT listings. Applicants must complete their application online and submit official transcripts and their ACT or SAT scores. Transfer students at WKU must have a minimum GPA of 2.0 for their last semester of full-time work before applying. Those transfer students with more than 24 transferable credits are exempt from submitting high school transcripts and standardized test scores. Incoming students must have a Composite Admission Index score of 60, a minimum 2.0 cumulative unweighted GPA, and ACT or SAT scores. Incoming students who are 21 years or older don't have to submit ACT or SAT scores. As an online learner at WKU, you will have access to many academic resources including advising, adult learner services, online library access and online tutoring. Florida State College at Jacksonville's Bachelor of Applied Science in Information Technology program offers small class sizes, a flexible curriculum, hands-on learning and stays current with industry needs through its IT Advisory Committee. The mission of the program is not only to provide training in the technical IT skills, but also to create a cadre of strong management professionals. Students can expect to gain skills in effective communication and project management along with the necessary specialized technology skills. The accelerated program can take as few as 20 months to complete online. To graduate, students must complete 120 credit hours of coursework. Lower division information technology course requirements include 27 credit hours in courses such as Information Systems, Hardware Configuration and Introduction to Project Management. Upper division coursework comprises of 39 credit hours in courses such as Business Law and Ethics, Business Writing, Database and Physical Design, Electronic Commerce Systems and Strategies and Organizational Behavior. A senior capstone course which covers an array of relevant topics is also required to graduate. For students who have experience in IT already, the program also considers alternative ways to earn credit through Prior Learning Assessments, demonstration of industry certifications or the creation of a portfolio of prior learning experiences. The career pathways graduates often enter include web development, computer programming, database administration and computer and information systems management. Because of the heavy focus on business administration within the program, graduates can climb the ladder within the field to managerial, and even, executive positions. St. Petersburg College's online Bachelor of Applied Science in Technology Development and Management is designed to provide a foundation for both the practical tech skills and the management skills to poise graduates for career advancement within the field. The program is delivered at an accelerated pace with 8-week courses. Students can choose to complete coursework completely online or in a blended/hybrid format. Because this is a degree completion program, students must have completed 60 credits in a related discipline from a regionally accredited institution which includes at least 15 general education credits and 21 technical credits. The bachelor's requires 120 credits (that includes the 60 previously earned credits). Major core courses such as Legal Aspects of Managing Technology, Applied Systems Analysis and IT Services Management comprise of 30 credits. The subsequent major requirements include courses specific to the concentrations in Data Analytics, Cybersecurity, Software Development and Project Management. The program requires all students to complete a senior capstone course as well. Upon graduation, students should be able to lead small- and large-sized teams, effectively manage technology projects, come up with innovative technology solutions, assist with an organization's profitability, think strategically about organizational processes and provide strong leadership to ensure security of an organization's technology platforms. The program has an active Advisory Committee of industry professionals that helps to ensure that the program is aligned with current industry needs and continues to evolve along with the technology being studied. Graduates can expect to enter careers at all levels of management in computer and information systems, industrial production, network and computer systems, software development and business and web data analysis. Keiser University offers small classes and hands-on learning experiences through the online coursework in the Bachelor of Sciece in Information Technology Management program. The curriculum is specifically career-focused with the intention of making coursework applicable to employment upon graduation. For information technology students with an associate's degree in a computer-related field, this completion program provides training and education for computer and information technology professionals to enter supervisory and managerial positions in the field. Because the program is designed as a completion program, students must complete at least 24 credit hours of general education credits as a prerequisite to the program. Students must also complete prerequisites in upper-division courses in microeconomics, English, math, psychology and statistics. The program requires a completion of 60 credit hours of courses centered on information technology and management. Upper division general education courses (Management Information Systems, Organization and Technology of Information Systems, Professional Writing, Critical Thinking and Intermediate Statistics) consist of 15 credits and Information Technology Management major credits consist of 45 credit hours. Courses toward the major include Accounting for Non-Financial Majors, System Analysis, E-Business Infrastructure Management, Information Technology Management, Database Management Systems, Operations Management and Project Management. Upon graduating from the program, students will not only have the necessary technological skills necessary for an IT career, but they will have a foundation in basic business principles, critical and systems thinking, communication skills and problem-solving skills to position them in a management position within the field. Colorado State University Global Campus (CSU-Global) touts that its sole educational focus is distance learning. Through their 100% online, 8-week long courses, CSU-Global offers a fast-track, flexible option for prospective students interested in information technology through the Bachelor's Degree in Information Technology program. The program prides itself on being appealing to "techies" who are also data-focused and helps students apply the coursework in the real world in a growing industry. The program not only prepares students for a variety of information technology jobs, but it also includes training toward a variety of certifications (e.g. CompTIA A+, CompTIA Security+, Microsoft SQL and Microsoft Server 2012). Through the program's partnership with CompTIA, students may even receive discounted rates on any CompTIA exams. Students may also choose to specialize in areas such as Computer Programming, Cyber Security, Data Management and Analysis and Virtualization and Cloud Computing. The bachelor's requires the completion of 120 credits to graduate, but students may transfer a number of undergraduate credits or benefit in alternative credit options where students earn credit from competency-based exams, demonstration of relevant prior learning or military service credit. Core information technology courses include Applying Leadership Principles, Information Systems and Security, Information Technology Project Management and Network Enterprise Solutions. Graduates of the program often begin their career as IT project assistants, security analysts, IT technicians and data processors and can work their way up to senior-level positions as project managers, security managers and analysts in a variety of fields. CSU-Global is tuition consistent for all students (rather than different tuition scales for in-state and out-of-state students). University of the Cumberlands sees the increased need for cyber security as one of the driving forces behind its online Bachelor's Degree in Information Technology program. As one of 200 universities in the U.S designated by the National Security Agency (NSA) and the Department of Homeland Security as a National Center of Academic Excellence in Cyber Defense (CAE-CD), the program positions graduates to enter roles such as systems analysts, software and web developers, computer network architects and computer programmers with a strong focus on security no matter the career track one takes. While security is integrated within all concentrations, students may choose to specialize in one of 4 areas: Cybersecurity, Infrastructure, Management or Software Engineering. To graduate, students must complete 128 semester hours of coursework (74 hours of which are general education credits). The bachelor's degree core requirements include 30 semester hours of coursework in topics such as Application Software, Information Security and Assurance, Networking and Business Intelligence. The core also includes a capstone offered each Fall semester where students integrate the learning from their courses into a real-world project. In addition to the core, students may complete 6 hours of electives from outside their own concentration. Students may be able to transfer up to 90 hours of coursework (of "C" grade or higher), especially for general education requirements. Additionally, University of the Cumberlands offers Credit for Prior Learning (CPL) for certain qualified students who either have experience or certification in a variety of courses. Oklahoma State University Institute of Technology's Bachelor of Technology in Information Technologies offers 3 concentrations that can be achieved online (aside from some remedial courses): Cybersecurity and Digital Forensics, Network Infrastructure and Software Development. Cybersecurity students can expect to be prepared to handle the ever-evolving challenges of cyber attacks making their skills essential in the current digital landscape. Network Infrastructure students become specialized in managing large networks (e.g. local area networks, wide area networks, intranets, etc.). Software development students gain a foundation in designing, developing and implementing database and web applications. The bachelor's degree requires a total of 121 credit hours (associate level general education courses may be transferred over). The major requires 70 hours of technical credit and 1 hour of College Strategies credit. While there are general education and IT core courses required for all students (e.g. Introduction to Computer Logic, Network Systems, Web Development and Script Programming), much of the remaining coursework is dependent on the concentration. In addition to regular undergraduate admissions applications, prospective students must submit a background check release form and a separate application for the Bachelor of Technology the semester before beginning the program as a student must hold an Associate of Applied Science or higher to qualify for acceptance. Students with previous experience or certifications may also complete a Prior Learning Assessment to receive credit for prior learning. While no degree can guarantee you a particular salary or career path, a bachelor’s in information technology can help you find a high paying job in a rapidly growing field. According to the BLS, computer and information technology workers can earn a median annual salary of $84,580, which is more than double the national median salary for all workers. When looking for a career, information technology students should consider not only salary, but also job growth potential. The table below provides information on wages and job growth for several IT-focused occupations. These professionals, often called information technology managers, oversee an organization’s computer systems. They work with managers and executives to determine the technology needs of a firm, and then implement the appropriate hardware and software. Daily responsibilities might include supervising computer professionals, overseeing the installation of new hardware, and exploring possible system upgrades. Computer network architects, sometimes called network engineers, design and build computer networks that help organizations operate. They create small local area networks and larger wide area networks. These professionals evaluate an organization’s needs and build systems within an office or across many locations. In a typical day, a network engineer might meet with management, upgrade hardware, and research new technologies. Network and computer systems administrators maintain various types of computer networks and ensure these systems function properly. They make software and hardware upgrades, assess security threats, and fix network issues as they arise. These administrators also add new users to a network and train them to use available software and hardware. They regularly evaluate systems and work to optimize performance. Database administrators employ specialized softwares to store and organize data for a variety of organizations. They may manage financial information, health records, or shipping information. In a given day, database administrators will import new data, backup existing information, and conduct system tests. They also secure important data by regulating database access. Information security analysts protect an organization’s computer networks, systems, and data. Day-to-day responsibilities depend largely on the industry and employer. These analysts continuously monitor security threats and take action when they detect a breach. They consistently upgrade security software and conduct tests to identify vulnerabilities in the system. The following list provides salaries and job growth data for computer and information systems managers in each state. Some states have exceptionally lucrative industries that pay their workers a higher-than-average wage. Other areas lack information technology professionals, which leads to a high worker demand. Connecticut, Massachusetts, and Washington boast high concentrations of computer and information systems managers. Below you will find courses that students often encounter when earning an online bachelor’s degree in information technology. Each online IT degree has specific course requirements, but most curricula include the same basic classes, such as data management, information systems, and network security. Thoroughly research each school you are considering to find courses, electives, and concentrations. This course introduces databases and the various ways organizations store, manipulate, assess, and display data. Students may learn to use common data management and analysis tools. In this course, information technology students learn about algorithms and fundamental programming languages such as C++ and Java. They may learn to develop basic applications, design user interfaces, and debug. Network security courses cover the need for security in computer systems. Students learn common techniques for identifying vulnerabilities, assessing security threats, and responding to breaches. This course covers the business side of information technology. Students learn to lead effectively, supervise employees, and apply organizational leadership principles to the information technology field. In this course, learners study how various organizations utilize information systems. Students learn how information technology is one of the many resources businesses can use to gain a competitive edge. Students should consider many factors when choosing a bachelor’s program in information technology. Research each school’s accreditation status and consider attending an accredited school. Evaluate each school’s academic offerings and prioritize programs that incorporate interesting electives and concentrations. In addition, take into account that attending a highly reputed school might make it easier to find a job or summer internship. In the section below, answers are provided to some common questions about online information technology programs. Should I Choose a Specialization? If you plan to enter a specific career after graduation, you might consider focusing your studies in a particular area of information technology. Some common concentrations for information technology students include cybersecurity, database management, and health information technology. If you do not have a particular job in mind, you may prefer to pursue a general studies track. How Long Will It Take Me to Earn a Bachelor’s in Information Technology? Most bachelor’s in information technology programs require students to complete about 120 credits. Students usually complete these programs in eight semesters, or four years; however, some students can earn a bachelor’s degree faster by taking advantage of summer courses or by taking extra credits during the school year. In addition, some programs offer an accelerated option for students looking to graduate in under four years. Can I Participate in Internship or Fieldwork Requirements as a Distance Student? Some information technology programs require a practicum that allows students to gain workplace experience. For these programs, distance students may work with faculty to find a local organization where they can complete the experiential learning requirement. Most online programs aim to provide distance students with the same experiences and courses as on-campus students. Will My Bachelor’s Degree Prepare Me to Receive Any Industry Certifications? Yes. Some information technology programs incorporate coursework that prepares students for certification exams. For example, network security courses sometimes prepare students for the CompTIA Security+ certification exam. Many programs include coursework relevant to the Microsoft Certified IT Professional credential. In addition, some programs administer certification exams and include the exam costs in tuition. How Should I Choose Electives? Most programs post a list of available electives online. Check courses online and take note of any courses that seem interesting. If you have a particular career in mind, consider taking electives that develop skills relevant to that position. In addition, take into account that some programs allow students to take electives outside of information technology. Earning a bachelor’s degree tends to be costly, and annual tuition ranges from under $10,000 at public institutions to over $40,000 at private universities. To reduce tuition costs, students should take advantage of scholarships and grants. Students should prioritize scholarships over other forms of financial aid, since they do not have to be paid back. Student loans, on the other hand, can come with high interest rates. Below you will find some scholarships for information technology students. Through this scholarship program, the Armed Forces Communications and Electronics Association supports students majoring in STEM fields, including computer systems, cybersecurity, information resource management, and information technology. To qualify, applicants must be sophomores or juniors at an accredited four-year college and must earn a 3.0 GPA or higher. Candidates must submit an official transcript and at least two letters of recommendation from faculty. The Foundation for IT Education, an organization that promotes research and education in information technology, supports students through several scholarships. The Betty Stevens Frecknall Scholarship is named for a former department of housing and urban development analyst who advocated for equal opportunity in the STEM field. For consideration, applicants must have finished one semester of college, and have a 3.0 GPA at minimum. Candidates must be pursuing a major related to information technology. Palantir Technologies, a software company founded by Silicon Valley billionaire Peter Thiel, has offered the Women in Technology Scholarship since 2010. Through the scholarship, Palantir aims to encourage women to pursue STEM careers in computer science, engineering, and technical studies. The program selects 10 finalists who receive up to $10,000 in grants. Scholarship finalists also receive a free trip to the Palantir headquarters in Palo Alto, where they participate in professional development workshops and meet engineers. The Powerline Group, a software development and mobile application company, offers scholarships to students majoring in computer science, technology, digital design, or software development. Candidates must be enrolled full-time at an accredited two-year or four-year institution and must demonstrate a high level of academic achievement. The company offers one national scholarship and one for students studying in Long Island, New York. Each recipient receives a $5,000 award.